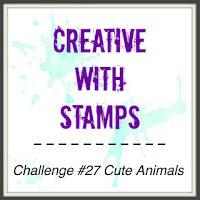 June has arrived and the new challenge at Creative With Stamps is up and running with a theme of "Cute Animals". I just LOVE the Unicorn Magic Set from Flora & Fauna and had to use this adorable unicorn image for my card. Our sponsor is our Design Team Member, Gwen, of Desperate Housewife Craft. See the Creative With Stamps Blog for details. 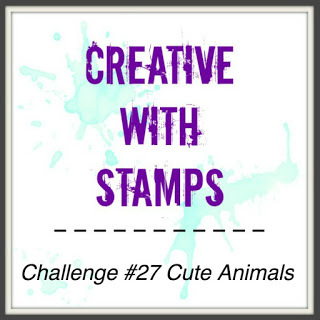 Please head over to the Creative With Stamps Blog and see what the Design Team has created for your inspiration, and join us with a cute animal creation of your own for a chance to win. See you in the gallery! Your card is beautiful, I like it very much. Such a fun stamp. Love the card! A bicycle-riding unicorn??? LOVE IT!!! This is sooooooo imaginative and fun!! Love all the white with your other details....really makes them pop. Too bad you didn't have a unicycle for the unicorn! lol... Thank you for sharing your pretty card!!! Lustiges Motiv. 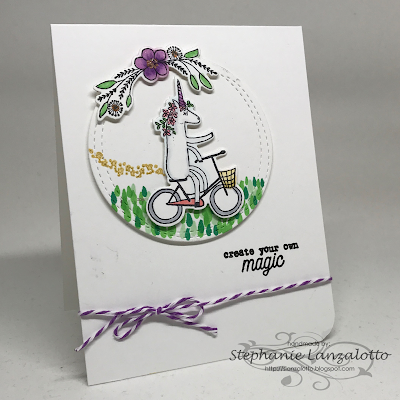 A Unicorn on a bike, a funny image and card.